منع الانتحار هو مصطلح شامل للجهود الجماعية والمشتركة التي تقوم بها المنظمات المدنية المحلية وممارسو الصحة النفسية والمختصون ذوو العلاقة لتقليل مدى وقوع الانتحار. ^ Bertolote، Jose (October 2004). "Suicide Prevention: at what level does it work?". World Psychiatry. 3 (3): 147–151. PMC 1414695 . PMID 16633479. ^ Coppen A (2000). "Lithium in unipolar depression and the prevention of suicide". J Clin Psychiatry. 61 Suppl 9: 52–6. PMID 10826662. ^ WHO, 1998 نسخة محفوظة 25 مايو 2017 على موقع واي باك مشين. The Suicide Prevention Resource Center (SPRC) provides prevention support, training, and resources to assist organizations and individuals to develop suicide prevention programs, interventions and policies, and to advance the National Strategy for Suicide Prevention. The JED Foundation is the leading nonprofit organization working to reduce the rate of suicide and the prevalence of emotional distress among college students. Suicide Prevention:Effectiveness and Evaluation A 32-page guide from SPAN USA, the National Center for Injury Prevention and Control, and Education Development Center, Inc.
American Association of Suicidology is a membership organization for all those involved in suicide prevention and intervention, or touched by suicide. 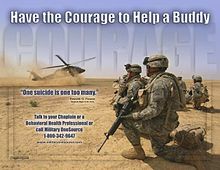 American Foundation for Suicide Prevention is the leading not-for-profit dedicated to preventing suicide through research, education and advocacy. International Association for Suicide Prevention Organization co-sponsors World Suicide Prevention Day on September 10 every year with the World Health Organization (WHO). Samaritans of Singapore is a non-profit and non-religious organisation which aims to provide 24-hour confidential emotional support to people in crisis, thinking of suicide or affected by suicide.